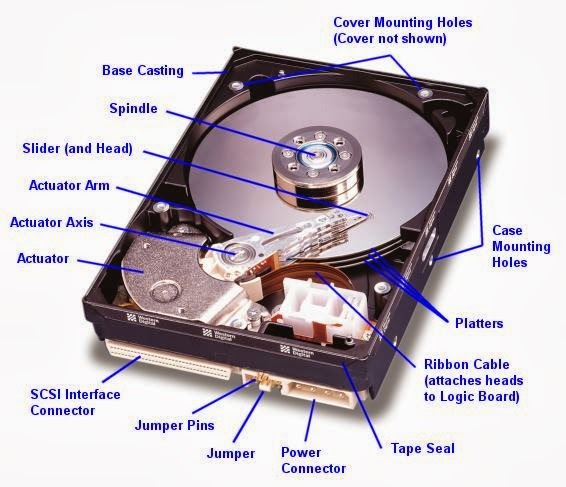 How does HDD (Hard Disk Drive) Work ? 1. Platter is where your data is written / stored on. 2. Actuator arm (i call it magnetic arm) is what writes the data onto platter using a very powerful magnet. 5. Each time data needs to be written or read from/to HDD, the magnetic arm will move onto right position to write/read the data. Right, now that you know how HDD works, lets move on! What is defragmentation / defragging ? Now that you know how HDD works we take a look what is fragmented data, how and why it occurs and what exactly defragmentation does to improve your HDD speed and life. 4. Green bits on bottom to right belong to one application and are not fragmented. 5. Red bits belong to one application and are fragmented all over the place. What does does it all mean? 1. 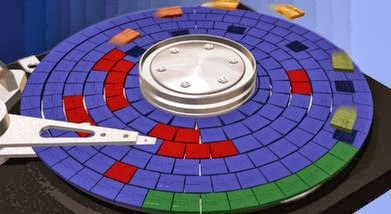 If program is not fragmented (like the green bits), then magnetic arm does not have to move to read it, HDD platter simply spins and magnetic arm remains in same location, just reading the bits in a simple row. 2. However if program is fragmented all over the HDD, like the red bits, then imagine what will happen if magnetic arm tries to read the program from HDD platter? See the point already? If fragmented data needs to be read from HDD, it results in many magnetic arm's movements, therefore significally slowing down the read process. Also this reduces the lifespan of HDD, because any type of movement = wearing. So the more magnetic arm moves, the more it wears obviously. Does SSD need to be defragmented / defragged ? You do not need to defrag SSD (Solid State Drive). Because SSD (Solid State Drive) does not work like HDD, you do know what a USB stick is right? It's pretty much the same, just a lot faster than USB sticks. In short, flash memory works pretty much the same way as HDD (data is being stored onto a microchip instead of platter), however there are no moving parts, meaning that data can be read/written onto/from any location without any type of movement or speed reduction. So SSD has no moving parts (this is why its Solid State), therefore it makes absolutely no difference in what location data has been stored, because it can be accessed instantly without any type of movement, so defragging of SSD is just waste of time, in fact it reduces the lifespan of SSD, so don't do it. Because SSDs can be used only limited time to write data onto it, for example if you take HDD and SSD and constantly write data onto them (lets take security camera system for example, where camera overwrites the previous data on HDD when full), then SSD will fail a lot sooner than HDD, HDDs can last 10 years easy, i have some HDD's from like 2005 or so and they still going strong. Most nowday SSDs don't just fail, they just reduce in size, they will know if they have flash cells that have failed, so they mark it as failed and data will never be written there again and SSD reports the max size little bit smaller than it is, so SSD will probably last easy 10 years, but size will be reduces. I've had mine over a year and haven't noticed any reduction at all (and i use my PC every day, for at about 5 - 20h a day). How do i defrag my HDD / Best way of defragging ? I recommend using "Auslogic Disk Defrag", it is very easy to use and does good job. I do not recommend using any software that comes with your hardware (hdd, motherboard, whole pc or with windows), those are crap.